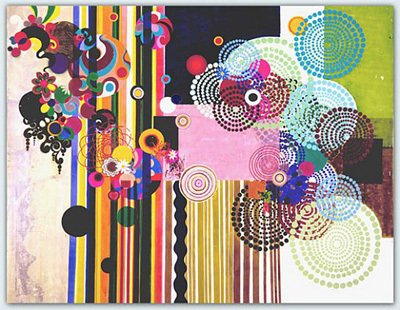 Beatriz Milhazes, Pacaembu, 2004, acrylic on canvas, 105 3/4 x 135". Beatriz Milhazes’s vibrant oeuvre could best be described as “tropical baroque.” Her all but flat yet densely layered canvases recall bold textile designs, architectural ornamentation, even Brazil’s lush, indigenous vegetation. This exhibition, the Rio de Janeiro–based artist’s most comprehensive to date, will span the past two decades and feature thirty paintings, ten prints, and, at the heart of it all, five collages. In focusing on the last, curator Ivo Mesquita hopes to reveal the extent to which that medium informs Milhazes’s practice as a whole. The artist will also create two large window paintings in the Pinacoteca’s sunlit halls, which can only give her flora-inspired work an added radiance. Milhazes’s show promises to be the antipodal summer’s most colorful presentation outside the city’s famed botanical gardens.